Popovers - You're Making a Mess!You're Making a Mess! Cooking is best when there is a story, an event, a gathering. One of the things I love most about food is that it’s the center of so many great things — it combines friends and family, art and nourishment, gadgets and fire. For most of us, many early memories come from watching our mothers, fathers, grandmothers, aunts — whoever — in the kitchen creating a meal or a dish. Foods we eat become associated with those people, and preparing them becomes a great way to look back on fun times. Popovers will forever be associated with my Aunt Candy. I vividly remember staying over at her place with my cousins and whipping up these puffy, crispy, eggy rolls and eating them hot out of the oven with an assortment of delicious, sweet toppings. It was the perfect snack for a sleepover — easy to whip up with ingredients on hand, versatile, and eminently satisfying. It’s not so much that we made them all that often — realistically, it was probably not more than 2 or 3 times — but until then, I had never eaten a popover, and hadn’t really revisited them until I started making my own. Popover come from a delicious family — Yorkshire pudding, crepes and puffy baked apple pancakes are all made with a very similar batter. 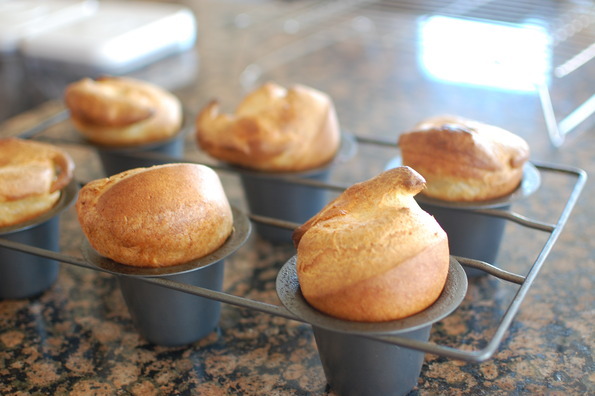 The main difference is in the pan — a popover pan is similar to a muffin tin, but with even deeper cups. The deep cups give the popovers more vertical lift. Like the puffy baked pancake, the key to a lofty popover is whipping enough air into the batter, and using it relatively quickly (within 10 minutes or so). The small bubbles that form when you aggressively beat, whip, or blend the batter turn into steam inside the oven. The steam then propels the batter upward, where is is held in place by the proteins in the flour that start to solidify from the heat in the oven. Much like a balloon, the steam inflates the inside while the outside “skin” holds everything together. Pretty cool. 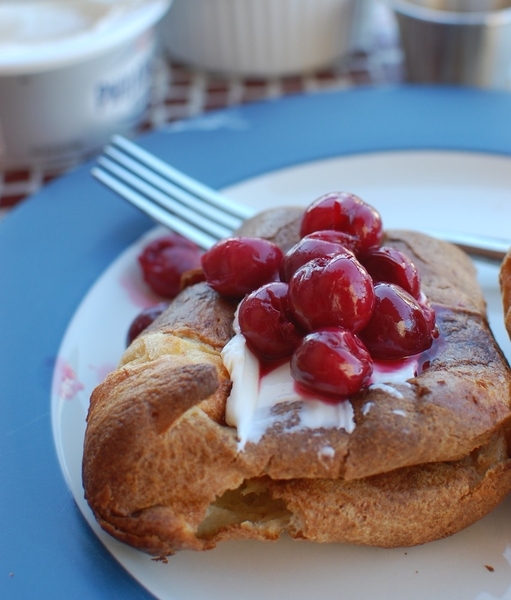 Enjoy it with just about anything — savory popovers with carne asada, bleu cheese and carmelized onions; sweet ones with cherries, cream cheese (or cottage cheese — my favorite — try it!) and a dusting of sugar, or butter, sugar and lemon. They store very well for a day or two in a bag on the counter, or frozen for longer. I used Alton Brown’s recipe, but I found the salt to be a little much. Try 1 teaspoon, or less if you’re using toppings with a lot of salt.